Water Borehole uk | Geothermal or Ground Source Heat? The two terminologies are often confused! Geothermal Energy is usually generated from deep underground where rocks are superheated from the earth’s core. Boreholes are drilled into these hot rocks where deep aquifers produce steam often in excess of 300° centigrade which is used to drive turbines which produce electricity at a commercial industrial scale. Where no natural aquifer is present, water is pumped down the borehole into the hot rocks and the resultant steam drives the turbines to create electricity. In countries such as Iceland where high pressure superheated steam is abundant beneath the surface, the steam from one borehole can be piped many miles from the borehole location to centrally heat the houses of towns and cities. 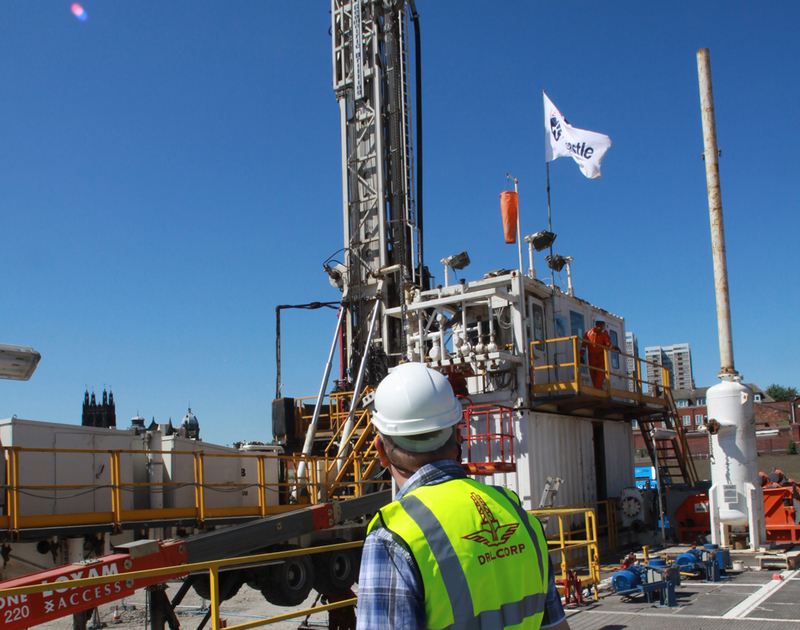 In the UK hot rocks geothermal sources are relatively rare however Drilcorp has been involved in the drilling of test boreholes to explore for hot rocks anomalies which may be used to generate community heating. Exploration boreholes have been drilled in Newcastle upon Tyne as well as Weardale to depths of up to 1880mtr and heated water (although not superheated) was found. These boreholes are currently being monitored and tested. Ground Source on the other hand uses solar energy that has been absorbed into the surface of the earth which is harvested and condensed by a ground source heat pump (GSHP) which circulates antifreeze liquid on closed loop systems or groundwater on open loop systems to centrally heat properties. The ground source heat pump can be operated in reverse to remove heat from properties and in this instance the heat is dumped into the ground. A closed loop ground Source system is a ‘closed system’ (meaning that all of the pumped media remains constantly within the pipework of the system) which uses refrigerant pumped around pipes which may be placed just below ground in a trench or, alternatively, when space is limited, the pipes are ran vertically down a borehole to depths usually 100mtr – 200mtr but occasionally deeper. The length of trench or quantity of boreholes depends on the size of the system required to service the property. Drilcorp has carried out many installations for properties ranging from a domestic residence with one closed loop to large commercial installations consisting of hundreds of closed loops. An open loop ground Source system is an ‘open system’ (which means that the pumped media is not held within the system and, once used is returned to the strata). Generally pairs of boreholes are drilled and these consist of an abstraction borehole and a recharge borehole. Groundwater is pumped using a submersible pump and it is then forced through the ground source heat pump where heat is transferred either from the water to the building for heating purposes or from the building to the water for cooling purposes. The water is then returned to flow away into the aquifer. Drilcorp has carried out many installations particularly in London where most systems are used for cooling purposes. Examples are Royal Festival Hall and Prada on Old Bond Street. Drilcorp does not design geothermal or ground source systems but can be relied upon to professionally carry out all drilling, installing, test pumping and commissioning of boreholes whether geothermal exploration or ground source. Monitoring wells and their environmental Importance.